Aug. 17, 2009, 9 a.m.
By Mac Slocum @macslocum Aug. 17, 2009, 9 a.m.
New York is furious about the mayor’s new Twitter habit, Chicago is snickering at an Oprah lawsuit, and Los Angeles continues to mourn the passing of director John Hughes. These city-wide emotional check-ins are plucked from NBC’s recently launched local web network. The network’s 10 sites, all associated with NBC owned-and-operated broadcast stations, feature “mood” applications that capture audience sentiment at the story level. Think of it as a hybrid approach: combining the structure and ease of web polls with the strong emotions typically found in user comments. Here’s how the mood application works: Visit a story on an NBC local site and look for the adjacent mood bar that notes current voting in six categories: furious, sad, bored, thrilled, intrigued, and laughing. Cast your own vote through the accompanying drop-down menu and watch as percentages update accordingly. That’s all there is to it on the user’s end. At the site level, though, those emotions get turned into data. An automated system showcases the five stories with the highest number of ratings in a “mood status line” embedded in the site’s header that changes with each refresh. “It’s not a static mood line that’s sitting up there,” says Gittrich. “It chooses the most emotional stories, the most mood-rated stories. It shows the different perspectives of each city.” Toward that end, mood ratings and user comments do not travel between sites in the network, even on stories with a national focus — the intent is to capture city-specific emotions. Aggregated mood data could have a life beyond the websites as well. Gittrich says staff at the NBC stations have expressed interest in mood information, although he hasn’t yet seen it included in broadcasts. And this sort of regimented, push-button feedback seems tailor-made for mobile — 10 city-specific NBC Local iPhone apps are slated to launch in September — and alternative platforms such as trains, taxis, stadiums, etc. On a broader scale, NBC’s master database of mood results makes cross-city tabulations and other internal data mining possible. There’s also potential for future developer access via APIs, according to Robyn Peterson, vice president of product at NBC Local Integrated Media. The ability to mine and display collective opinion gives websites one more pathway to serendipitous discovery — the absence of which has been lamented since the Daily Me was first conceived. Features like “most commented posts” or “most emailed stories” can make it easier for users to find interesting content on a site, but NBC’s mood effort goes a step further by overtly integrating audience activity into highly visible spots on the sites. It’s a way to boost the audience’s feeling of community. We’ll see whether moods — or something similar — eventually become as commonplace as comments and slideshows as tools to make website visitors stick around a little longer. POSTED Aug. 17, 2009, 9 a.m.
Slocum, Mac. "Hope you’re “intrigued” by this post: Moods in the spotlight on NBC Local." Nieman Journalism Lab. Nieman Foundation for Journalism at Harvard, 17 Aug. 2009. Web. 24 Apr. 2019. Slocum, Mac. "Hope you’re “intrigued” by this post: Moods in the spotlight on NBC Local." Nieman Journalism Lab. Last modified August 17, 2009. 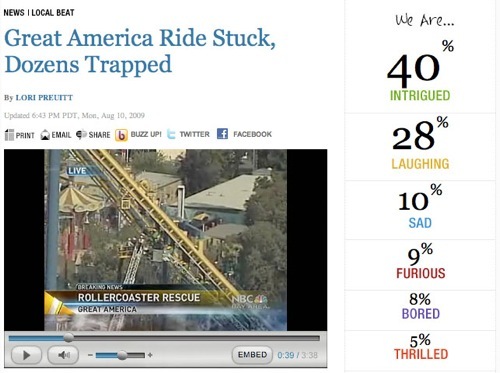 Accessed April 24, 2019. https://www.niemanlab.org/2009/08/hope-youre-intrigued-by-this-post-moods-in-the-spotlight-on-nbc-local/.